How do solar eclipses affect the weather? On the morning of Friday 20 March 2015 a rare near-total solar eclipse will occur in the UK. Why do meteorologists, as well as astronomers and amateur scientists, have the day marked on their calendars? The last partial solar eclipse over Reading was on 11 August 1999. Eyes are good at adapting to diminished light so the partial eclipse experienced in Reading on that occasion didn’t seem so very dark, but there was a strange feeling in the air and even as a scientist I had a slight niggling worry that perhaps this time the sun wouldn’t re-appear from behind the moon. Fortunately it did though, and it turned out that we were actually more fortunate in our eclipse viewing in Reading than were many people who went down to Cornwall to experience the total eclipse there. Cornwall was cloudy due to an occluded front lying close to the west of Ireland, whereas we only had partial cloud cover. This post is not about how weather can interfere with our eclipse viewing though, instead it’s about how eclipses can interfere with our weather. We’ve known for a long time that a solar eclipse causes a reduction in insolation and an associated reduction in surface temperature. Winds also tend to slacken and reduce in variability during an eclipse due to the stabilization of the boundary layer and associated reduction in turbulent motions. Karen Aplin and Giles Harrison made some measurements during the 1999 eclipse at both Camborne in Cornwall and at our Atmospheric Observatory here in Reading. In Reading they observed a maximum reduction of temperature of about 2 degC occurring about 15 minutes after the time of maximum eclipse, and the expected pronounced drop in wind speed and reduction in variability. They also found some evidence of a more controversial impact of an eclipse on weather, wind direction changes at the onset and end of the eclipse. Figure 1. Is the ‘eclipse wind’ myth or meteorology? This ‘eclipse wind’ is associated with an hypothesized eclipse cyclone that occurs due to the cold outflow of air from the umbra (the region totally obscured by an eclipse). The debate on the existence, or otherwise, of the eclipse wind dates back more than a century with some authors claiming that the highly emotional state of eclipse viewers is responsible for its perception (i.e. we imagine it). We’re very fortunate in the UK to have a high density of meteorological stations reporting hourly (synoptic) weather measurements. A couple of years ago Giles Harrison and I took advantage of improvements in weather forecast models since 1999 and compared synoptic weather measurements from the 1999 eclipse against a high resolution (1.5 km grid spacing in the horizontal) simulation of the state-of-the-art Met Office weather forecast model. 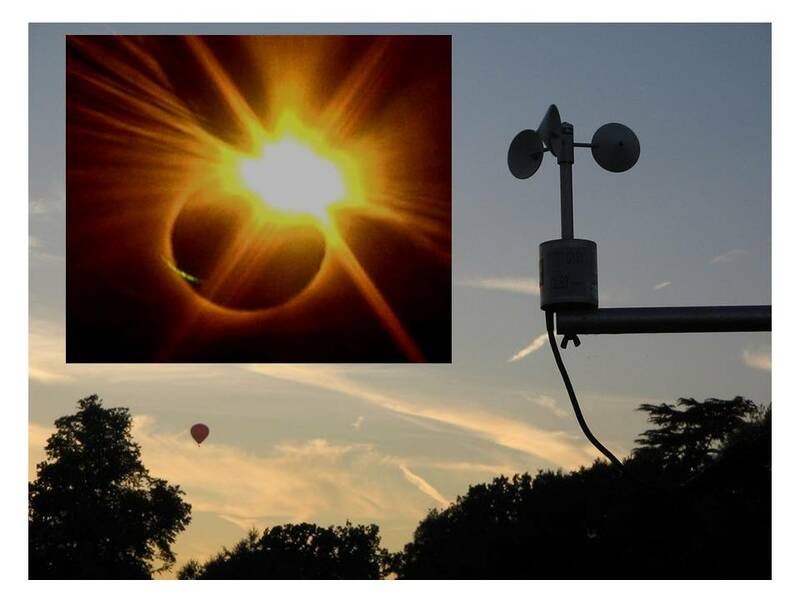 We concentrated our analysis on an inland relatively cloud-free region, including Reading, and found differences occurred between the evolution of the station measurements and forecast predictions at the same stations after the onset of the eclipse. The winds decreased by an average of 0.7 m/s and turned anticlockwise (backed) by an average of 17 degrees in the station measurements, but not in the forecasts. Is this finally conclusive proof of the eclipse wind? The eclipse on 20 March could provide the evidence we need to settle the debate conclusively. To do this we need lots and lots of meteorological data during the eclipse event – fortunately there are a lot of amateur meteorologists who could potentially help. Schools are invited to participate in a live national eclipse weather experiment working with The University of Reading and BBC Learning in association with the BBC Stargazing Live programme. Can you help us solve the mystery of the eclipse wind? This entry was posted in Eclipses, Environmental physics, Weather and tagged eclipse weather, eclipse wind, solar eclipse. Bookmark the permalink.